GoDaddy.com, a popular web host and domain registration site, went down Monday morning, impacting "associated customer services," a GoDaddy spokeswoman told TechRadar. "Intermittent outages" began around 10:25 a.m. PST, Elizabeth Driscoll, GoDaddy's vice president of public relations, said, though services "began to be restored for the bulk of affected customers at 2:43 p.m. PST." "At no time was any sensitive customer information, such as credit card data, passwords or names and addresses, compromised," she said. The company initially tweeted out a message to its customers that it was "aware of the trouble people are having with our site" soon after the outage was reported. The issue was being addressed, the tweet assured. As of 1:11 p.m. PST, the company's official site appeared to once again be up and running, though sites hosted by the service - including those with only their domain name registered - were still down. According to TechCrunch, those with GoDaddy email accounts and users of the company's phone and DNS services were affected as well. A member of notorious hacktivist group Anonymous took to Twitter to claim responsibility for the attack, though Driscoll made no comment about a cause in her response to TechRadar. Initial reports pointed to the outage as a collective effort by the group, however "AnonymousOwn3r" said he or she was solely responsible for the attack. "@TechCrunch," AnonymousOwn3r wrote to the site, "please edit [your story]…the attack is not coming from Anonymous coletive, the attack it's coming only from me [.]" The person, reportedly from Brazil, is a "Security leader of #Anonymous ( Official member ) according to his or her bio. A tipster indicated GoDaddy's offered a technical reason for the outage as a problem having to do with the "inaccessibility of GoDaddy's DNS servers." 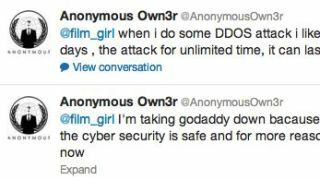 Though GoDaddy has come under public fire in the past for supporting the Stop Online Piracy Act (SOPA) and the Protect IP Act (PIPA), AnonymousOwn3r offered a partial reason for his or her attack through a response to another tweeter. "I'm taking godaddy down because well i'd like to test how cyber security is safe and for more reasons that i can not talk now [.]" Later responding to the same person, who asked how long the outage would last, AnonymousOwn3r said: "when i do some DDOS attack i like to let it down by many days, the attack for unlimited time, it can last one hour or one month [.]" @AnonOpsLegion, who encouraged AnonymousOwn3r's actions with a supportive "Good job brother" tweet, sent out another possible motive. "By using/supporting Godaddy, you are supporting censorship of the Internet," @AnonOpsLegion tweeted. Driscoll said more information is forthcoming and thanked GoDaddy's customers for their patience and support. TechRadar will update this story with information from GoDaddy when it becomes available.